This is another installment of guest blog posts by scholars of music and disability studies. Jeannette Di Bernardo Jones is a graduate student and teaching assistant in musicology at Boston University, and is a contributor to the OUP Handbook on Music and Disability Studies (forthcoming 2014). Her master’s thesis, completed for degree requirements at Louisiana State University, is a study of The University of Pennsylvania MS. Codex 436. My seven-year-old son and I were sitting in a cafe on a cold, rainy evening in February in Washington, D.C. having just come from the Kennedy Center. 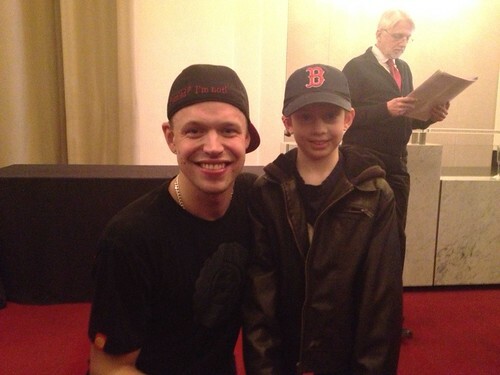 My son, Ellis, was beaming in the warm afterglow of seeing Signmark for the first time, the Deaf rapper from Finland. As a parent, I’ve taken my kids to concerts before, but this one was different. I was at the Signmark concert as a musicologist, taking notes for my own research, and I brought my son all the way from Boston to see this, because he’s Deaf, too. In February 2013, Signmark performed at the Kennedy Center, representing Finland as one of the featured performers of the month-long Scandinavian festival at the Center, called “Nordic Cool.” Including Signmark in a cultural festival distances his work as a deaf artist from medical implications of deafness and shifts them more in a political and cultural light, which is consistent with Signmark’s artistic goals. The audience rippled with the signing hands of Deaf and hearing people, communicating together, or simply waving their hands in applause. Signmark called from the stage, “Rhythm isn’t something we hear, but also see and feel,” as he encouraged the audience to move their hands and bodies along with the music. I underestimated how much seeing Signmark would resonate with my seven-year-old. Ellis has a fair amount of auditory access through the use of a cochlear implant (CI), but he also signs. American Sign Language is his first language. During a bilingual concert, he could choose either modality listening with his CI or listening with his eyes. He chose the latter. As the music started, Ellis took in the first few songs in his seat, but then as he latched on to Signmark’s performance, he became more engaged, waving his arms, and fist-pumping the air along with the music. The show is worked out between Deaf Signmark who signs and his colleague Brandon who speaks. They are well coordinated in the dialogue in-between songs, but sometimes there is some variance between how they are interacting with the audience. Ellis was completely tuned into Signmark. He responded to all the signing, and for the last song, when Signmark invited everyone to the front, Ellis ran up to the front to be closer, joining in, jumping up and down. When it was over, I said we could meet Signmark. My somewhat shy Ellis surprised me. He was frantic to meet him, running and pushing his way ahead to find Signmark. We were rewarded with this sweet picture. At the age of seven, my son has not yet encountered the prejudice of the hearing world that deaf people can’t or don’t experience, enjoy, and perform music. After his encounter with Signmark, he will know that this is not the case, and he has taken to writing his own songs at home now. 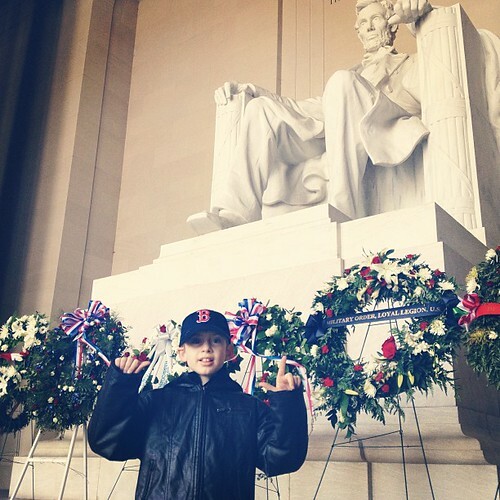 The next day, I took him to see the monuments. Perhaps the most significant one for me to show him was the Lincoln Memorial. This memorial represents the struggle for minorities to gain equality and social justice in a majority world that would otherwise oppress them. We remember M. L. King, Jr. standing on the steps declaring his dream. But many don’t realize that King’s dream was echoed over twenty years later by the Deaf students in Washington, D.C., who borrowed banners from the civil rights movement to declare their own dream of having a Deaf president for the first time at Gallaudet University—which would symbolize the rejection of nearly two hundred years of paternalism perpetuated by hearing medical and educational professionals. If you look closely at Abraham Lincoln’s hands, it is said that the sculptor, Daniel Chester French, who had a deaf son, formed the ASL letters “A” and “L” for “Abraham Lincoln.” Standing there with my deaf son, I felt proud that he could say to me just the night before, “I want to do what that Deaf music guy does.” To know that he stands on the shoulders of so many who have advocated for the rights of the deaf. And to know that as a musicologist, I have a role to play.